I taught myself to dye and hand paint fabrics in high school. I experimented with dyes, paints, wax, gutta resist, rubber bands and woodblocks to make designs on fabric and on clothing. 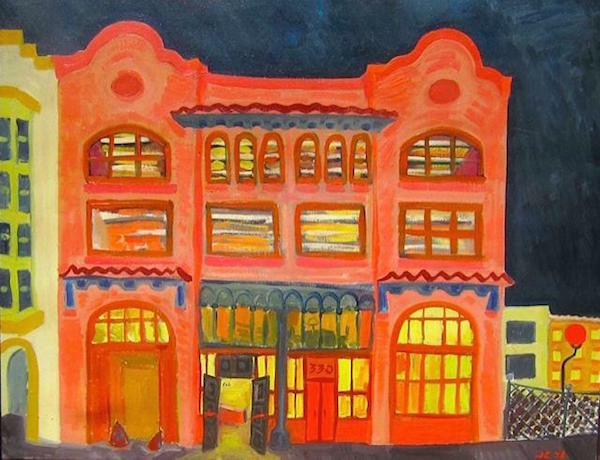 I moved to San Francisco when I was 18 and dyeing and sewing became my job. I made colorful things to sell. Then I got into dyeing yards and yards of silk for designer Lea Ditson. I joined “The Angels of Light Theater Company” and one of their communal houses was right by the Gay Community Center at 330 Grove Street. 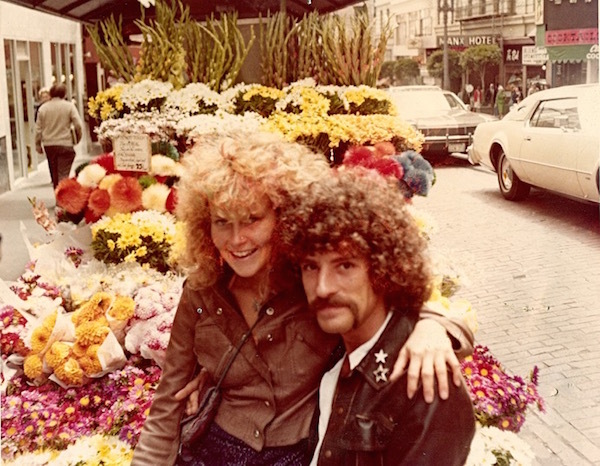 At one point, Gilbert Baker and I were roommates. Back then I did not know my sexuality. I had a girlfriend but later realized I was heterosexual with extremely strong feelings for LGBT rights. But all my friends were LGBT and we were all experimenting. Mostly we just cared about art and found prejudiced people irritating. Anyway – I rented a room at the Center in which I could do my dyeing. I had a few clients who wanted my clothes. The Center had no water heater so I had to heat the water up in big canning pots and then mix it with the cold water in giant trash cans—dye-vats. And there was no washer or dryer so I had to rinse by hand then put the cloth in trash bags and run to the Laundromat. It was work. Well, in 1978 there was going to be a Gay Parade and the Gay Parade Committee needed decorations. Originally we were going to decorate City Hall with bunting, but our plans changed when we were offered the Civic Center flagpoles and the two large poles at UN Plaza on Market St. Lee-Lee Mentley, who ran the Top Floor Gallery at 330 Grove and founded the Artist Coalition, helped us buy art supplies after the Committee gave us money. We were excited!! I had made flags before for a sailboat club in Sausalito. I knew where to buy white cotton muslin fabric, where to get dyes in bulk, grommets, threads, etc. Gilbert, James McNamara and I brought our sewing machines, irons and ironing boards to the Center and we bought trash cans. The smaller flags along the reflecting-pool each needed an artist to dye-paint and sew them. 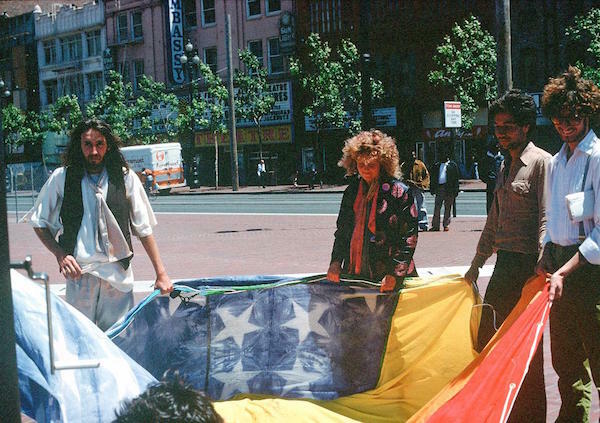 Then there were the two big flags on Market Street—James and I said we’d do those, with James supervising the sewers. James went to FIT (Fashion Institute of Technology) in New York City and was amazing with sewing, cutting, constructing. He taught Gilbert how to sew in the early 1970s. Now, what to put on them? I’m sure we all had a meeting about this but I was “the Rainbow Faerie” so I wanted them to be rainbow colored flags. We all agreed. 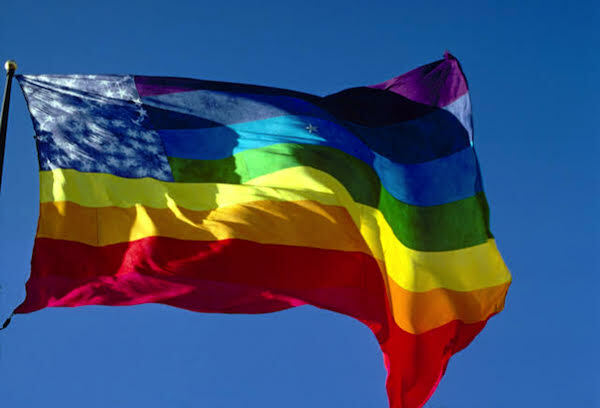 I decided the sequence of colors would be reversed on the two big flags: pink, red, orange, yellow, green, aqua blue, royal blue, violet on one. The other one would start with violet then royal blue, etc. I dyed each strip by hand—and I decided mine would have stars in the corner, like the American flag. This meant I had to cut two sets of matching woodblock cut like stars, varnished, glued and c-clamped to the white cloth that was folded in a special pattern to make “repeating stars in a circle.” I was not sure it would work but thank the heavens it did! We prewashed the fabric, dyed it all by hand and rinsed it all by hand on the roof of 330 Grove and then dashed off to the Laundromat. Then we ironed all of it—pinning, working out what went where. Future documentarian Glenne McElhinney was there as a volunteer. James sewed all the strips together for the big flags but a lot of volunteers showed up to help us, thank god!! We needed them! It was a big job. We were worried about finishing on time. We had a test-run day before the parade. Someone had a truck to put them in and someone else had the keys to the flagpoles. Somehow it did. 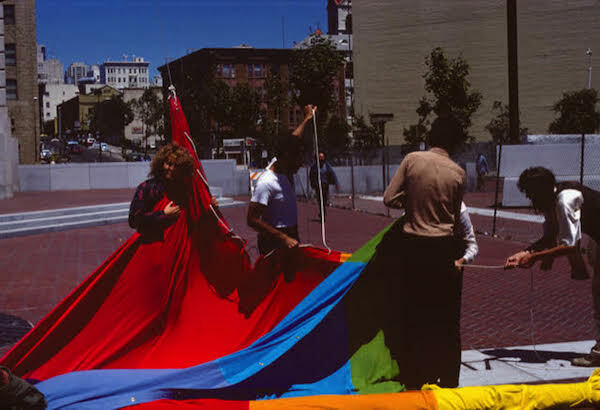 On June 25, 1978, all the flags for the San Francisco Gay Freedom Day Parade were beautiful—the reflecting pool flags and the two big rainbow flags. James was also a photographer and took great photos of what we did. Thank heavens his close friend Paul Langlotz kept them all! 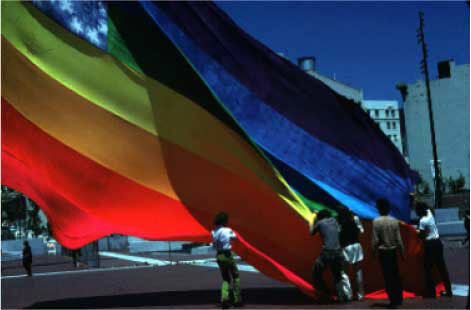 Gilbert is usually given all the credit for creating the Rainbow Flag—but really it took three flag makers, the artists from the Eureka/Noe Valley Artist Coalition, (founded by Harvey Milk, Scotty Smith and Lee Mentley), the Parade Committee and countless volunteers to create all the color that made the Rainbow Flag stick in people’s minds that Gay Freedom Day. I know it sounds corny but I believe in the power of color—rainbow color—to heal people. I’m still a believer today.